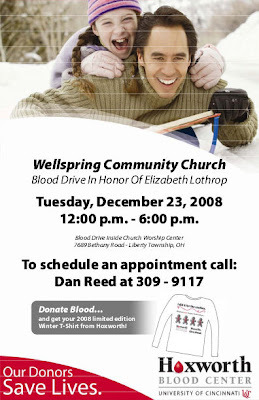 Liz Lothrop Update: Blood Drive in honor of Liz! We have no idea who the donors have been, but we do know that their selfless giving has saved Lizzy's life! She has had more blood transfusions over the past month and a half than I can remember. Will you join us in giving back to Hoxworth this Christmas season! You too can save a life! I will absolutely try to get there to donate! Thanks for making us aware of this opportunity. We have have room for 40 more donors for next weeks replacement blood drive for Lizzy! To date we have over 65 wonderful people signed up who care deeply about you. What a gift!!! You can be 16 years old (110 pounds) and give with your parents permission. Call 309-9117 to make your appt.